The growing popularity of e-bikes gave the German bicycle market a long awaited push. The combination of the expanding e-bike market and the growing public awareness of the advantages of cycling to solve mobility problems means Germans are continuing to spend more money on cycling. According to the 2011 sales statistics on the German bicycle market published by the country’s industry organization ‘Zweirad Industrie Verband’ (ZIV) total sales value were up 8.8% to just under €2 billion. BERLIN, Germany – The growing popularity of e-bikes gave the German bicycle market a long awaited push. 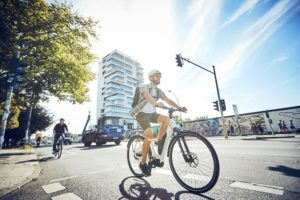 The combination of the expanding e-bike market and the growing public awareness of the advantages of cycling to solve mobility problems means Germans are continuing to spend more money on cycling. According to the 2011 sales statistics on the German bicycle market published by the country’s industry organization ‘Zweirad Industrie Verband’ (ZIV) total sales value were up 8.8% to just under €2 billion. In 2011 approximately 4.05 million bicycles and e-bikes were sold to the trade; an increase of 1.1% compared to 2010, according to ZIV’s statistics. With an average of €495 the retail price per bike (including e-bikes) continues to rise. Production in German increased even more than the retail market. In 2011 some 2.29 million units were made, 2.6% more than in 2010 when 2.23 million bikes came of the German assembly lines. Importers saw their market growing even further according to the ZIV statistics. In 2011 they imported 2.84 million bicycles and e-bikes in Germany, an increase of 5.1% related to 2010. The biggest importer to German was once again Taiwan with 337,000 units followed by the Netherlands with 279,000 and Poland with 268,000 bicycles. Although Taiwan is still the main importer the volume has dropped by 17% since 2009, when the total stood at 404,000 units. The average value of imported bikes is, thanks again to the e-bike, growing faster than the market. The average retail price of imported bikes in 2011 stood at €220, up 6.8% over the previous year. In comparison, export volumes have been pretty stable in the past years, at around 1 million units. In 2011 the exact figure stood at 1.08 million units, an increase of 6% compared with 2010. The average export value now stands at €376, an increase of 6.8% over the previous year. “80% of these bicycles are fully-equipped according to traffic regulations reflecting the growing mobility usage. The quality awareness of the German consumers is also reflected by the relatively small market share of imported bicycles. With 52.8% of all bikes imported, nearly one of every two bikes originates from Europe. Therefore the outlook for the German bicycle, bicycle parts, components and accessories industry could not be more positive,” said Neuberger. 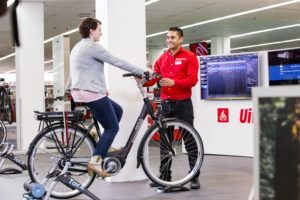 According to the German retailers’ organization VDZ the growing importance of the e-bike is also reflected in the fact this product already accounts for more than 10% of the bike sales in units at several shops. The increase in revenues of the IBDs is above the average development of total retail in Germany. The German bike retailers saw nominal increase of 2.4% in 2011 while the total retail sales improved by 0.5% only. The VDZ underlines that the often referred to e-bike boom is mainly to the benefit of the medium and larger retailers. In general the smaller shops did not have more turnover thanks to the e-bikes. However, due to lower margins on electric bicycles, the total gross profits declined, together with a rising need for capital, thanks to the higher average stock. Excess inventory in the warehouses in 2012 might even lead to liquidity problems for some retailers warns the German retail organization. Innovations, almost a constant theme with e-bikes, do stimulate demand and are therefore positive for the industry. On the other hand, they also result in a faster decline in the value of overstock. This might cause problems for medium size and larger retailers. The biggest dealer cooperative in Europe, the Zweirad Experten Gruppe (Two-Wheel Experts Group) with its main base in Germany, reported an all time high turn-over for 2011. Last year total sales amounted €455.5 million, an increase of €59.2 million or 14.9% compared to 2010. With this increase ZEG outperformed the European bike sector, as well as Germany’s growth in 2011. 2011 saw a lot of rumours swirling around the company Derby Cycle Werke. 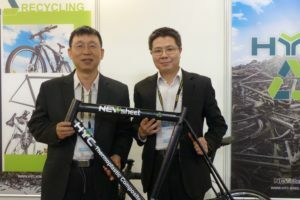 This bicycle manufacturer and distributor of the brands Focus, Raleigh, Univega, Kalkhoff, and Rixie is taking full advantage of the rapidly growing e-bike market, at home and on export markets. Reason enough for CEO Mathias Seidler to announce an IPO in January 2011. Derby Cycle was the first German company to go public in two years and that brought Mathias Seidler a lot of attention. And he needed it, as many financial analysts were sceptical. In the end Derby Cycle only managed to sell 6.09 million shares out of a total of 6.84 million which traded at €12.50; at the bottom end of the targeted range between €11.50 and €15.50. Seidler was quick to state that, “the price of Derby’s shares will not go sky high as, like in the whole bicycle sector, the margins are too small and the industry is too fragmented.” His finest hour was still to come as the automobile industry knocked on his door later last year. The Dutch company Pon Holdings wanted to re-enter the bicycle market and after they acquired Dutch Gazelle, their next target was Derby Cycle. Their aim was to obtain 100% of the shares and they offered a price of €28 per share. In the end Accell Group’s attempt failed and Pon Holdings was the winner. In the meantime Derby’s e-bike sales doubled in its 2010/2011 fiscal year while total bicycle sales increased by 12.1% compared to the previous fiscal year. It resulted in a 36% growth in revenues to a total of €235.5 million. 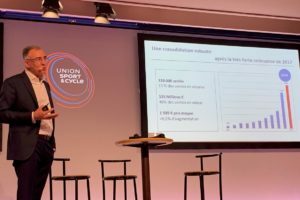 At the presentation of the results 2010/2011 CEO Mathias Seidler was very clear about the importance of e-bikes: “We have doubled our sales of electric bikes from 44,000 in the previous year to 87,000. These figures also reflect the particularly strong contribution that electric bikes are making to the company’s growth. Above all, our electric bikes are making outstanding progress on the market, and have played a particular role in bolstering our growth.” And that’s exactly what new owner Pon Holding wanted to hear. 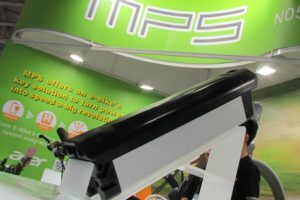 The forecast for the German IBDs is most promising according to the study “Bicycle industry focus 2011” by the German dealer association VSF. Germany’s bike market is expected to grow by 3.65% in turnover year-on-year between 2012 and 2015. During the last two years the turnover in bikes among the VSF ‘premium’ dealers increased by 9.4% already. According to the VSF, the average retail price of an e-bike amounts to €1,975 while regular bikes sold on average for €600. The e-bike market share sold at VSF premium dealers increased from 8.94% in 2010 to 11.62% in 2011, with an average price of €2,175. Albert Herresthal, GM of the VSF emphasized the importance of electric bikes for the German economy. “As the bicycle industry sold 300,000 e-bikes in 2011 alone; only 1,800 electric cars were registered. While the car industry is working on electric mobility; e-bikes have become a mainstream product already,” said Herresthal.